As I posted on June 18, the report of the Office of the Chief Coroner of Ontario on All Accidental Cycling Deaths in Ontario From January 1st, 2006 to December 31st, 2010 highlighted the need for complete streets. But what is a complete street? And what can we do to lobby for them? TCAT, the Toronto Centre for Active Transportation, has been working on complete streets since 2006. Their definition of complete streets is below. 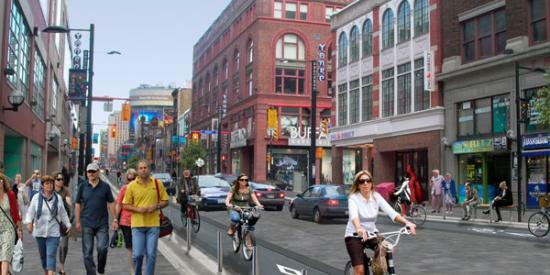 You can read more about complete streets for Canada here. A Complete Street is designed for all ages, abilities, and modes of travel. On Complete Streets, safe and comfortable access for pedestrians, bicycles, transit users and the mobility-impaired is not an afterthought, but an integral planning feature. A Complete Streets policy ensures that transportation planners and engineers consistently design and operate the entire street network for all road users, not only motorists. Complete Streets offer wide ranging benefits. They are cost effective, sustainable and safe. The link between Completes Streets and public health is well documented. Jurisdictions across North America already include Complete Streets policies in their suite of preventative health strategies. Complete Streets also promote livability. Human-scale design treatments such as street furniture, trees and wide pedestrian rights-of-way animate our public realm and encourage people to linger. Complete Streets can exist in communities of all shapes and sizes; from downtown Montreal to Corner Brook and more suburban communities such as Surrey. There is no singular approach to Complete Streets. However, Complete Street policies ensure that transportation planners and engineers design and manage infrastructure for all ages, abilities, and modes of travel across the entire transportation network. This entry was posted on Wednesday, July 18th, 2012 at 5:04 pm	and tagged with complete streets, report of the chief coroner of ontario, tcat, toronto centre for active transportation and posted in Uncategorized. You can follow any responses to this entry through the RSS 2.0 feed.